The U.S. Census Bureau recently released its latest statistics from the American Community Survey, which cover the period from 2013-2014 for areas with a population of 65,000 or more. The statistics show that the number of New Mexicans with health insurance increased by five percent to 85.5 percent from 2013 to 2014, reducing the uninsured to 14.5 percent of the total population. Increases in public insurance drove the entire increase. The increase in the number of insured is in-line with the national trend where the number of insured in the US increased from 86.7 to 89.6 percent. Unchanged, however, is New Mexico still lags the national average by approximately four percent. The five percent increase in the number of insured in New Mexico was the largest from 2008 to 2014, a period when the rate was relatively steady. While the number of New Mexicans with private insurance held steady at 54 percent, those with public insurance increased by four percent to 43 percent from 2013 to 2014. Over time, changes in the rate of health insurance coverage and the distribution of coverage types may reflect economic trends, shifts in the demographic composition of the population, and policy changes that impact access to health care. Several such policy changes occurred in 2014, when many provisions of the Patient Protection and Affordable Care Act went into effect. 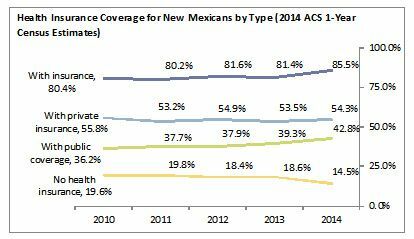 Health Insurance Coverage for New Mexicans by Type. Of the subtypes of health insurance, Employment-based insurance covered the most people nationally (54.2 percent) as well as in NM (43.2 percent). Nationally 16.3 percent receive Medicare benefits compared to 17.8 percent in New Mexico. New Mexico’s higher than average poverty rates contributed to 27.8 percent of the insured being on Medicaid compared to 19.2 percent nationally. Health Insurance Coverage by US-NM. The 2014 median household income of $44,803 for New Mexico was roughly unchanged from 2013 ($44,564). Nationally, Mississippi had the lowest median household income at $39,680. Maryland, at $73,971, had the nation’s highest median household income followed by New Jersey ($71,919), the District of Columbia ($71,648) and Alaska ($71,583). The mean Social Security income and mean retirement income in New Mexico was largely unchanged at $16,670 and $26,790, respectively. 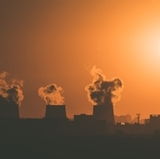 New Mexico’s Gini index came-in at 0.477, which is slightly below the U.S. index average of 0.480. The Gini index is a standard economic measure of income inequality. A score of 0.0 is perfect equality in income distribution. A score of 1.0 indicates total inequality where one household has all of the income. The District of Columbia has the greatest inequality with an index number of 0.522, while inequality in Alaska was among the lowest at 0.418. The poverty rate in New Mexico remained among the highest in the US at 21.3 percent, along with Mississippi (21.5%). The change from 2013 to 2014 for New Mexico was not statistically significant while Mississippi’s poverty rate declined 2.5 percentage points — one of the largest percentage-point declines of any state. The poverty rates of Mississippi and New Mexico were not statistically different from each other. 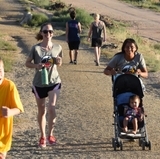 New Mexico experienced a population out-flow due to migration with 1,227 more people leaving the state in 2014 than those moving to New Mexico from elsewhere in the US. The net number of people migrating to New Mexico was positive for Oklahoma, Illinois, Florida, Alaska, Indiana, Wisconsin, and Louisiana, while more people migrated out of New Mexico (than migrated in) for the following states: Colorado, Nevada, Georgia, Oregon, Utah, South Carolina, Washington, Arkansas. 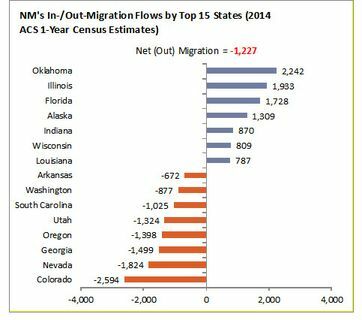 NM's In/Out Migration Flows by Top 15 States. The 2010-2014 American Community Survey five-year statistics, available for all geographic areas regardless of population size, down to the block group level, will be released on December 10th of this year. The American Community Survey provides a wide range of important statistics about all communities in the country. The American Community Survey gives communities the current information they need to plan investments and services. Retailers, homebuilders, fire departments, and town and city planners are among the many private- and public-sector decision makers who count on these annual results. Visit the Stats in Action page to see some examples. 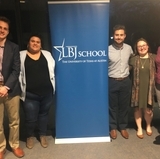 The 2013-2014 American Community Survey statistics are available for the nation, all 50 states, the District of Columbia, Puerto Rico, every congressional district, every metro area, and all counties and places with populations of 65,000 or more. These statistics would not be possible without the participation of the randomly selected households throughout the country in the survey. 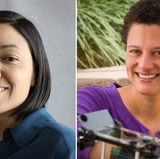 Contact the UNM Data Bank: (505) 277-6626 or bber.unm.edu. Contact the US Census Denver Region office (720) 962-3700 or 1-800-852-6159. For in depth population estimates (in-/out-migration), contact UNM Geospatial and Population Studies at (505) 277-3305.